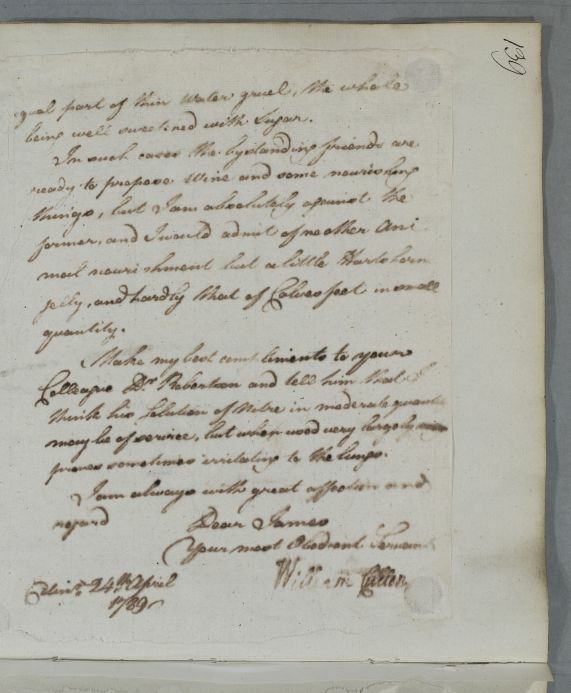 Reply, "Dr Robertson C[oncerning] ____", although this appears to be a mistake: the letter is written to James Wood. 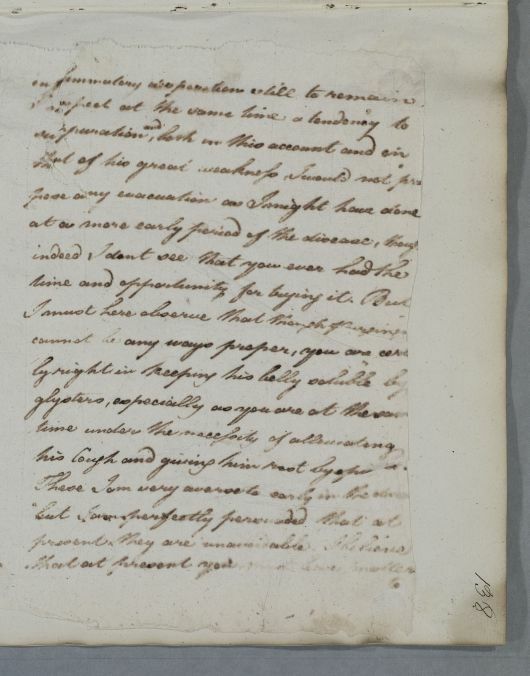 It concerns 'a young Gentleman who is your patient', about whom Cullen was consulted the previous day by Mr Richardson of Pitfour. The young man (Richardson's nephew) has a respiratory ailment. Cullen's advice includes preparing 'artificial Asses Milk' from cow's milk mixed with water gruel and sugar. He sends his regards to Dr Robertson. 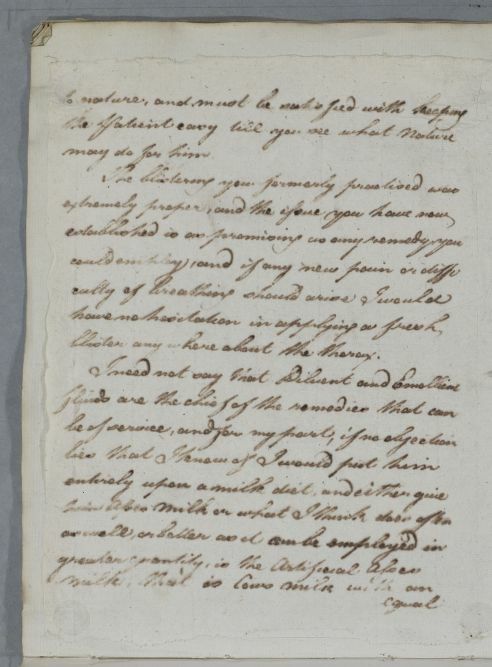 Summary Reply, "Dr Robertson C[oncerning] ____", although this appears to be a mistake: the letter is written to James Wood. 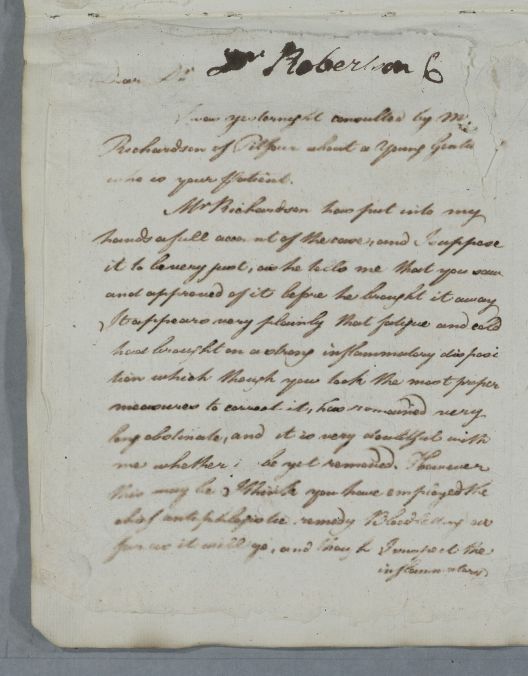 It concerns 'a young Gentleman who is your patient', about whom Cullen was consulted the previous day by Mr Richardson of Pitfour. The young man (Richardson's nephew) has a respiratory ailment. Cullen's advice includes preparing 'artificial Asses Milk' from cow's milk mixed with water gruel and sugar. He sends his regards to Dr Robertson. Case of Robert Richardson, who coughs up blood. his Cough and giving him rest by [opiates?]. blister anywhere about the thorax. being well sweetened with Sugar. proves sometimes irritating to the lungs.